Sakai Guides and DocumentationSakai Basics Site InfoHow do I add LaTeX language to my course site? Sakai can display LaTeX equations as mathematical notation in the rich text editor. Using LaTeX options, instructors and students can simply write LaTeX in an enabled tool and the resulting equation will be displayed beautifully. Select the check box to enable MathJax. 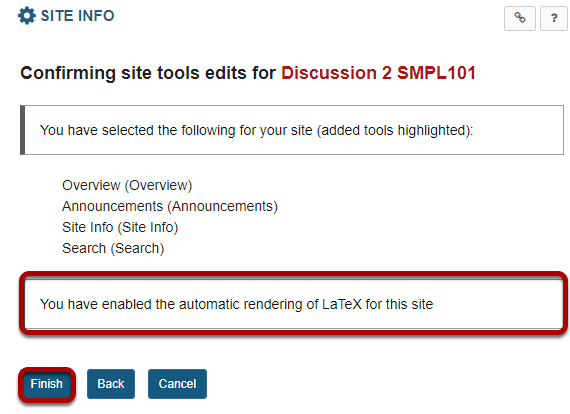 Zoom: Select &quot;Allow the display of LaTex math in this site.&quot; Click Continue. Below the Selected Tools list, check the box to Enable MathJax for automatic rendering of LaTex and AsciiMath in this site. Click Finish to confirm the change. Enter LaTeX equation in rich text editor. Insert "$$" before and after mathematical equation to set it apart from the rest of the text. Math equations are editable in the edit screen of the tool, but will display as equation in preview and student view. Equation displays as expected when viewed. Prev: What is the User Audit Log? Next: How do I remove a tool from my site?